Why am I jealous of poster board? Because my new poster gets to go to Istanbul, Turkey for next week’s EvoStar Evolutionary Computation conference without me. I just shipped it off this morning. 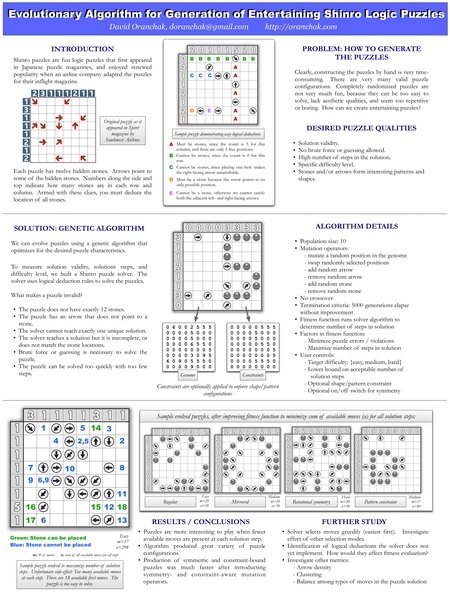 Combining puzzle-making with biologically-inspired computer algorithms. Because life isn’t already crazy enough. Click the above image to see the large version of the poster. Or, you can get a copy of the original PDF. And download the entire 10 page paper if you really want to bore yourself. We decided not to travel to Istanbul for the conference because of the expense and difficulty in getting there. Alas, I will not be able to experience the surreal juxtaposition of the geeky Mario A.I. competition amidst the majestic ruins of the ancient Roman, Byzantine, and Ottoman empires.